We are homeowners, sort-of. Well we own a home. But we don't live in it. We own a home and yet live in a 550 square foot apartment. If do not have a perception of what 550 square feet is, imagine a shoe box...550 square feet is a bit smaller than that. We don't live in this home that we own because we are renovating it. Now when I say we are renovating it, don't get the wrong idea. One might think that means we are hammering nails, or hanging drywall. Not so much. Nope, we have hired fantastic people to do said tasks. Fingers crossed, construction will begin next week. With a little help from mother nature last week and some finishing assistance from the landscapers, many trees have now been trimmed, and a few removed to make way for the addition to the home. No worries, tree lovers out there, many more will be replanted after construction. As I mentioned, we had a large storm last weekend that hit our suburb particularly hard. We lost a large evergreen tree, and some miscellaneous parts of other trees. After the storm was over, my parents, along with Jeremy and I went over to the house to survey the damage. It was at night, the storm had just ended, and we entered the house to find that we had no power. No problem. Leave it to Jay (my dad), to have a WIND UP flashlight in his car! 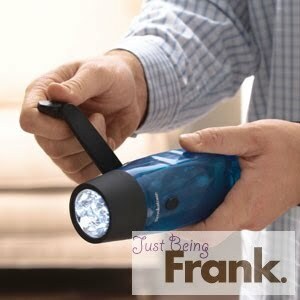 Yes, a windup flashlight. We walk into the home, the three of us creeping behind my dad, who looks as though he is reeling in the biggest fish of his life on a fishing pole, a fishing pole which is actually a wind up flashlight. We slump low, and creep behind him, as though the boogey monster might jump out. After much coaxing, Jeremy and my Dad supposedly entered the basement to check for water. They say they found none, but the entire trip down there took about 32 seconds.We find the collapsed tree, and decide to leave.Walking through an old, empty house with no power is creepy. Monday arrives and I receive a call from our builder: "Hey Kara, how are you?" Builder Guy: "Great, say, I'm at the house and was wondering, did you have your dog over here this weekend?" Kara: "No way, that place is gross, my dog has not been there"
Builder guy: "THERE IS WATER ALL OVER THE BASEMENT AND PAW PRINTS ALL OVER"
Kara: "Are you kidding me? Like what kind of paw prints?" Builder guy: "Big ones, I don't know.."
Kara: "But like a squirrel, or a mouse, or a raccoon..."
Builder guy continues in a high pitched squeal in a confusingly fast pace: "I don't f#*$%&# know the species, but something is down here!!!" And then I proceed to laugh hysterically, while he stands down there, and I stand in my office, safe from the wildlife living in my home. Good job Dad and Jeremy. Apparently you missed the basement full of water and the animals running around in the basement. Not that I'm saying I would have gone down there. So...if anyone wants to come to the zoo, otherwise known as our new, vacant house, just let me know. Isn't home ownership grand?! The American Dream! That is an amazing story! I wonder what kind of animal was down there. Take photos of the prints and see of someone can identify them! Can we move in yet?